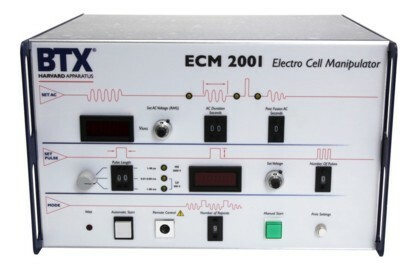 he Legacy ECM 2001 multi-purpose electro cell manipulation generator produces a proprietary AC waveform for electrophoretic alignment of cells and a square DC waveform for cell fusion. 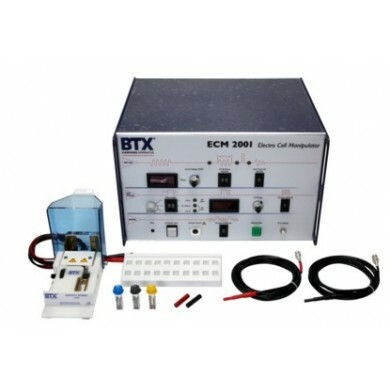 The Legacy ECM 2001 multi-purpose electro cell manipulation generator produces a proprietary AC waveform for electrophoretic alignment of cells and a square DC waveform for cell fusion. LEGACY ECM 2001 GENERATOR The LEGACY ECM 2001 is a multipurpose electro cell manipulation pulse generator capable of performing both electrofusion for hybridoma production, hybrid cell formation and nuclear transfer applications in addition to electroporation of cells in suspension and in vivo applications. This versatile platform combines microprocessor-controlled precision with a wide range of possible parameters for a wide range of applications when combined with standard cuvettes, high throughput plates, specialty electrodes and other available accessories. The Legacy ECM 2001 is intended For Research Use Only. Not for use in diagnostic, pre-clinical, or clinical procedures. The Legacy ECM 2001 is capable of producing a proprietary AC waveform for benign dielectrophoretic alignment of cells, and a square DC waveform for cell fusion. Electrofusion is carried out by applying both the AC and DC pulse waveforms. Microsecond switch-over time from AC to DC allows for highly efficient fusion. After fusion, the AC pulse reapplication maintains compression of the cells following the DC pulse for the rounding off process; resulting in a higher number of hybrids. The 1 MHz AC pulse aligns cells together in real time, saving time (seconds vs. hours) in comparison to PEG methods. Blastomeres and oocytes can also be aligned to the correct position for better fusion accuracy during nuclear transfer and embryo manipulation. The Legacy ECM 2001 EP System is designed for transfection of eukaryotic cells in suspension usingelectroporation cuvettes. 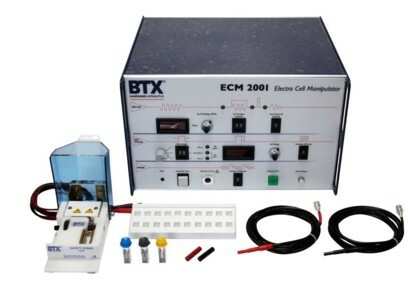 Utilizing the Legacy ECM 2001 for standard mammalian cell transfections is simple; the AC feature is turned off and the DC mode is set as a square wave electroporation device. The range of voltages and pulse lengths that can be programmed, coupled with the ability to carry out up to 9 pulses per experiment, make this an extremely versatile system for any lab. Electroporate adherent cells directly into the dish used for cell growth. The Legacy ECM 2001 coupled with thePetri Pulser electrode or the Petri Dish electrode allows researchers to avoid the trypsinization of their cell by electroporating adherent cells directly in the dish they are growing in. The Petri Pulser is ideal for 6-well plates and the Petri Dish Electrode is ideal for 100 mm petri dishes. 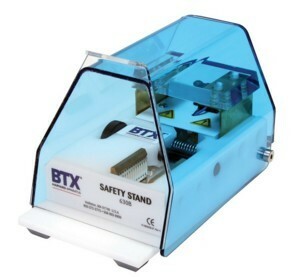 For use in hybridoma production applications, the Legacy ECM 2001 generator, 3.2 mm gap or 10 mm gap Microslides, and connection cables are required. 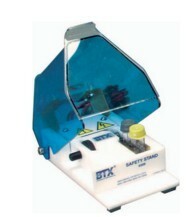 This system does not require proprietary fusion medium, but can be used with the Cytofusion Medium C for convenience. Electrofusion is achieved by the generation of a proprietary 1 MHz AC waveform for benign dielectrophoretic cell alignment, microsecond switchover from AC to DC creates efficient fusion results. After fusion, the AC pulse reapplication maintains compression of the cells following the DC pulse resulting in a higher number of hybrids.